Sorting: Day 5 - . Say it ain't SO!!! And the pile was getting so much smaller-ish. . . . Sometimes recognizing when you're beat is the real lesson. I take your blog very seriously... just in case I ever have boys. OMG. My brain just exploded for you. WOW. Is Bob's Dad crying right now? never laughed so hard, my now 25 year old so, did the exact same thing with his lego's! 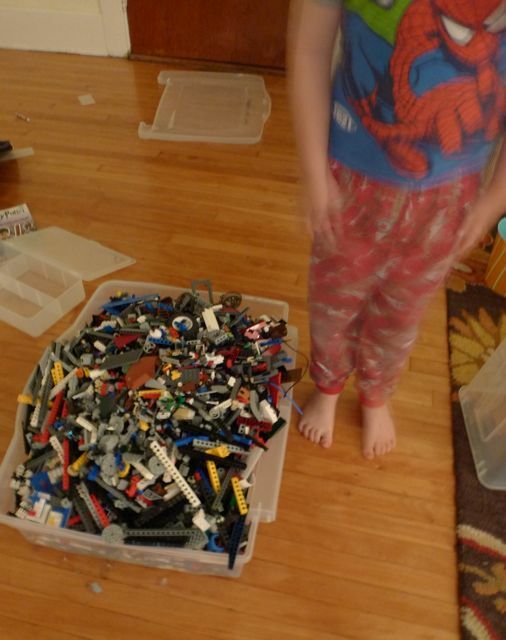 He spent a few days sorting and decided it was taking too long and just not worth it. The comment it has taken me five days to make (just problems with settings and I still don't get it)--if he only had girl cousins a little older those legos would have been sorted by lunch time. I have a grandson who is master of the technique.